I may not be Santa Claus, but I have an early present for you this year. It’s actually 15 presents in the form of 15 charts of financial markets with analysis by Bob Prechter, the president of Elliott Wave International. He created these charts – which cover markets like the S&P 500, NASDAQ, gold, and mutual funds – to explain where financial markets have been and where they are headed. These are not your typical price charts. They combine history and patterns to tell the story clearly, all from his distinctly different point of view. With this information, his Elliott Wave Theorist subscribers are now prepared for 2014. And you can be, too, because you can get the full 10-page issue, FREE. Elliott Wave International hasn't offered a free issue from Bob in quite some time, but they feel that the message of this issue is extremely important and can provide you with an outlook for 2014 that you shouldn't miss. Prechter says that “charts tell the truth.” Here is your chance to see what truths these charts are telling. If a picture is worth a thousand words, then this publication is like reading more than 15,000 words of his market analysis. Pointer: Be sure to check out one of the coolest charts, which shows how Main Street investors actually see the markets better than Wall Street. 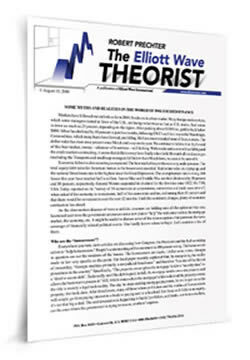 Download your free 10-page issue of The Elliott Wave Theorist now. Excerpt - Commodities are in a bear market. Figure 1 proves that the Fed’s feverish quantitative easing (QE)—i.e. record fiat-money inflating—is not driving overall prices of goods higher. The bear market in commodities began two months before the Fed’s massive asset-buying program began. Despite the Fed’s inflating at a 33% rate annually for five straight years, commodities are still slipping lower. This is yet another example of the non-existence of external causality on financial market prices. Such events are results, not causes. The Fed is not pro-acting but reacting. A picture of nominal vs. real S&P that shows there's "something wrong with this market"
Enjoy your present, It’s a once-in-a-blue-moon opportunity. And it’s free. See these 15 charts for yourself now. About the Publisher, Elliott Wave International Founded in 1979 by Robert R. Prechter Jr., Elliott Wave International (EWI) is the world's largest market forecasting firm. Its staff of full-time analysts provides 24-hour-a-day market analysis to institutional and private investors around the world.